Howard University Hospital is a major hospital located in Washington D.C. It is a private, nonprofit institution affiliated with Howard University. Howard University Hospital holds a Level 1 Trauma Center under the Division of Trauma and Critical Care. It handles more than 1,300 admissions annually and is one of the primary trauma centers for D.C. residents. Howard University Hospital's specialized services include endocrinology, ophthalmology, podiatry, diabetes education, pharmacy services and nutrition services. Additionally, the hospital's community-based programs include the Diabetes Treatment Center, a facility that service medical needs of patients with diabetes through a multidisciplinary approach to patient care. Howard University Hospital has an uplifting history. It was originally founded as The Freedmen's Hospital in 1862 in Washington D.C. This was the first hospital to provide medical treatment to former slaves. Eventually, it became the primary hospital for the African American community in D.C. The hospital was originally built on the grounds of Camp Barker at 13th and R Streets in Northwest Washington. In 1909, a new building was built at Bryant and 6th Street. In 1868, Freedmen's Hospital became a teaching hospital for the Howard University Medical School. One of the first members of the school's faculty was Lieutenant Colonel Alexander T. Augusta, M.D. Col. Augusta became the first black hospital administrator in U.S. history. Howard University Hospital has always been funded and managed by the federal government. Despite the control and management by the U.S. government, the hospital frequently found itself involved in various types of scandals from misconduct to malpractice. Numerous malpractice and misconduct cases were brought against hospital officials. In the early 20th century, the U.S. Congress authorized the construction of a new hospital facility and the new 278-bed hospital was completed in 1909. In 1967 Freedmen's Hospital was officially taken over by Howard University and the facility formally became Howard University Hospital. In 1975, the university opened a new main hospital facility building at 2041 Georgia Avenue. This remains the primary site of the hospital campus today. The original building on Bryant Street is now the home to Howard University's Cathy Hughes School of communication. Presently, Howard University continues to manage the facilities. Recently, Howard University Hospital has been having problems making sure their health facilities get proper involvement in the East End Hospital Act. On December 18, 2018, the D.C. Council passed The East End Health Equity Act was passed. This was an affiliation agreement with United Health Services. However, the original Act was passed without including Howard University Hospital. Traditionally, Howard University faculty and student have provided medical services to patients in Wards 7, 8 and other Wards, as well as training for hundreds of health care workers. As a result of this Act, these functions will be taken away from Howard University Hospital and transferred to George Washington University Hospital. Howard University Hospital generally receives lower rankings compared to other hospitals in the District of Columbia. According to U.S News & World Report, Howard University Hospital is rated high performing in only 2 adult procedures and conditions: chronic obstructive pulmonary disease (COPD) & heart failure. It is acknowledged as a general medical and surgical facility and a teaching hospital. U.S. News evaluates each hospital in up to 16 different medical specialties. The top 50 hospitals are nationally ranked based on hospital performances indicators. 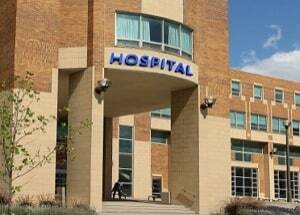 Unlike many of the hospitals in D.C., Howard University Hospital is not ranked in any adult specialty rankings. Additionally, most of the procedures or condition are not ranked either. In order for the hospital's procedures and conditions to be ranked, they must have a significant number of patients treated during the evaluation period. Only two procedures are high performing: Chronic Obstructive Pulmonary Disease (COPD) and Heart Failure. While Howard is struggling, the lack of hospitals that deliver babies in D.C. is leading to more patients. The maternal mortality rate in D.C. is 41 out of 100,000 which is not an acceptable rate for a developed country. The quality of a hospital's bond rating is sometimes correlated with the institution's bond rating. Howard's 2019 bond rating reflects the struggles of the hospital. A brutal 2017 article in the Washington Post revealed that Howard University Hospital may be coming apart at the seams. According to the Post story, HUH has been plagued by financial problems, accreditation troubles, empty beds, and a mass exodus of doctors and hospital administrators. To make matters even worse, the Post found that Howard University Hospital has been nearly overrun by a wave of medical malpractice lawsuits and payouts over the last decade. The Post examined almost 700 medical malpractice lawsuits filed against all of the major D.C. hospitals. This review found that Howard University Hospital had a higher rate of wrongful death claims per-bed than any other hospital in the city. From 2007 to 2017, Howard University Hospital was named as a defendant in 82 medical malpractice/wrongful death cases. 22 of those cases resulted in public settlements with the hospital resulting in total payouts of $27 million. Any settlements in the 60 other cases remained confidential. Aside from medical malpractice, Howard University Hospital has been frequently cited by regulators for violations of various health and safety rules. A former medical director of DC Fire and EMS reported that the hospital has a history of "bad care and long waits in the emergency room." The highly publicized David Rosenbaum case is one of the many examples of negligent treatment. David Rosenbaum's family reached a confidential settlement with Howard University Hospital, ending a lawsuit that accused Howard Hospital of negligence and medical malpractice. Mr. Rosenbuam was mugged and left on a gurney in a hallway at Howard Hospital for hours without being examined by a physician. Without anyone taking the time to examine him, he died. Just awful. Many similar unfortunate cases have originated from Howard University Hospital. Does this happen at every hospital? It does. Does it seem to happen at Howard Hospital more than other hospitals? Yes. Below are some examples of medical malpractice verdicts and settlements for Howard University Hospital. Keep in mind that most malpractice lawsuits against the hospital are settled confidentially so the terms and amounts are not publically reported. Osorio v Howard University Hospital (D.C. 2017) UNDISCLOSED: in this birth injury case Howard University Hospital and 2 of its OB/GYNs were sued for allegedly mishandling labor and delivery. The baby sustained a severe brachial plexus nerve injury resulting in permanent limitations and partial paralysis of the right arm (Erb's Palsy). Howard Hospital was defended by Rockville, MD firm of Gleason, Flynn, Emig & Fogleman. Malpractice claims were settled for an undisclosed amount. Nichols v Howard University (D.C. 2015) UNDISCLOSED: another birth injury case involving a delivery gone wrong at Howard University Hospital. In this case, the baby apparently suffered some type of brain injury because the hospital and doctors waited too long to perform an emergency C-section. The case was quickly settled for an undisclosed amount. Will we see even more birth injury lawsuits against Howard University as birthing wards continue to close down in D.C.? The fear is that we will. Annyanwu v. Howard University Hospital (D.C. 2008) $2,005,319: A 49-year-old female psychiatric technician alleged that she suffered foot nerve damage, headaches, a foot infection, and facial contusions when he was physically assaulted by a nonparty at the defendant hospital where the plaintiff was employed. The plaintiff contended that the defendant failed to properly adhere to hospital policies, failed to ensure that the nonparty was properly restrained, and failed to provide a safe work environment. The defendant denied liability and disputed the nature and extent of the plaintiff's injuries. Tiamiyu, Cunningham v. Nwaneri, Hodge, Howard University Hospital (D.C. 2003) $327,600: a female minor suffered left lung damage and the aggravation of a heart condition, resulting in permanent impairment to her heart and lungs after surgery was performed by the defendant doctors to close a patent ducturs arteriosis. The plaintiff contended that the defendant negligently ligated the left pulmonary artery when they failed to properly perform the surgery and performed the wrong procedure on the wrong vessel, and they failed to provide necessary information to subsequent physicians, and failed to properly supervise the residents. The defendants denied liability. Nevertheless, the judge awarded the plaintiff $327,000. Madison v. Howard University Hospital (DC 1998) $12,500: A female suffered burns to the thumb, hand and side of her body when hot water from a container spilled on her while she was a patient at the defendant hospital during recuperation from childbirth. The plaintiff contended that the defendant's employee negligently provided the plaintiff with an improperly sealed container of hot water and that the employee failed to sufficiently supervise the plaintiff. The defendant denied liability, disputed the extent of the plaintiff's injuries and contended that their employee was not negligent. If you have a potential claim malpractice or birth injury claim against Howard University Hospital the D.C. medical malpractice lawyers at Miller & Zois can help you get the best possible results. Call us at 800-553-8082 or contact us online.